A Kansas City, Missouri, Police Department officer remains in critical condition and on life support after a suffering a self-inflicted gunshot wound Friday night. The officer's family has decided to donate his organs and hospital staff are awaiting organ donor recipients, according to the KCPD. KANSAS CITY, Mo. — UPDATE, 1 p.m. Monday | Police say the officer died Monday morning. EARLIER | A Kansas City, Missouri, Police Department officer remains in critical condition and on life support after a suffering a self-inflicted gunshot wound Friday night. The officer's family has decided to donate his organs and hospital staff are awaiting organ donor recipients, according to the KCPD. Officers responded were searching for a missing and endangered person Friday night. 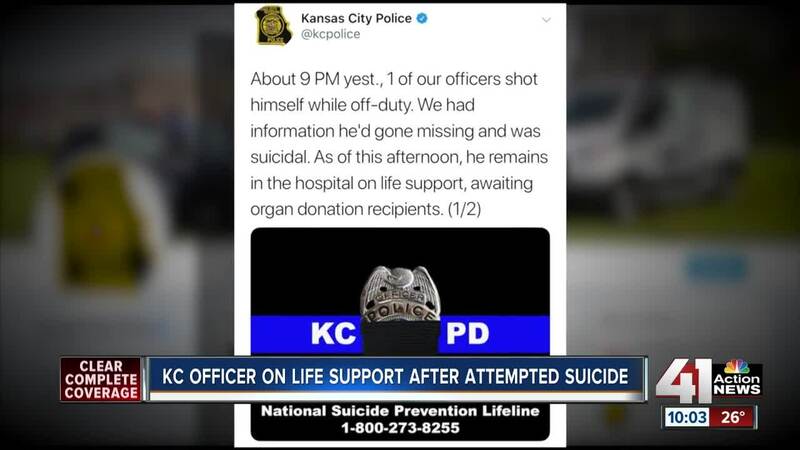 In this case, "a dedicated officer who has served our department for approximately 10 years ... was missing and feared to be suicidal," KCPD in a statement. Liberty police, who were assisting in the search for the officer's vehicle, located it in the Pleasant Valley Baptist Church parking lot about 9 p.m. Responding police officers found the officer suffering from a self-inflicted gunshot wound. The unidentified officer was transported to an area hospital in critical condition. Volunteer chaplains and peer-support resources have been activated and are available to department members and their families. The church where the officer was found also released a statement Saturday evening to 41 Action News. “Our hearts are broken and we are praying for the family, friends, law enforcement and all first responders impacted by this tragedy. As a church we offer pastoral care and also give referrals to licensed counselors for those who need care in our community," Pleasant Valley Baptist Church said. Anyone considering suicide is encouraged to go to a hospital, call 911 or call the National Suicide Hotline at 1-800-SUICIDE (784-2433).